Since 2003, the Martin Bodmer Library shows some of its treasuries to the public. From Egyptian papyruses of first importance, precious medieval illuminated manuscripts, Shakespeare’s First Folio to first editions of major writers of the twentieth century, the evolution of human thought is presented to the visitor in this museum built by the architect Mario Botta. 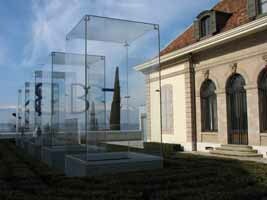 For further information, browse through the website of the Bodmeriana : www.fondationbodmer.org.